Roasting vegetables caramelizes them which brings out their full rich flavor, and gives them a sweetness that is delicious. 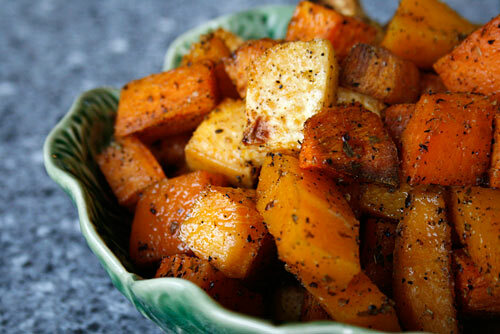 This recipe can be varied using your favorite root vegetables, and goes very well with roasted or grilled meats. For variations, you could sustitute white potatoes for the sweet ones, and carrots for the parsnips. After roasting, the vegetables are dressed with a light balsamic mixture that brings out the flavor even more. I prefer serving this dish at room temperature which makes it a great dish to prepare ahead of time, but if you prefer your vegetables hot, simply reheat behore serving in a hot oven for 10 to 15 minutes. Root vegetables such as sweet potatoes high in vitamin A or beta-carotene, which improves the health of the skin and prevents skin disorders, but they are also high in vitamins C, D, E, and K as well as fiber and other phytonutrients. Turnips and rutabagas provide an excellent source of vitamin C, fiber, folic acid, manganese, pantothenic acid, and copper. They also offer a very good source of thiamine, potassium, niacin, magnesium. In addition, they are a good source of vitamin B6 and E, folic acid, and riboflavin. Roasting vegetables caramelizes them which brings out their full rich flavor, and gives them a sweetness that is delicious. Cover two large baking sheets with aluminum foil. In a large bowl, mix together the vegetables, fresh herbs, salt and pepper, and 8 tablespoons of olive oil. Mix well so the vegetables are lightly coated in the oil. Lay the vegetables on the prepared baking sheets, and roast in the hot oven for 45 to 50 minutes, turning occasionally, or until the vegetables are browned and fork tender. Remove from the oven and allow the vegetables to come to room temperature. Mix together the dressing ingredients, and drizzle the dressing over the vegetables. Toss to mix, and serve.